We are very interested in better understanding and deliberately designing lifecycle properties into systems. Lifecycle properties are those characteristics of systems that are not the immediate functionality that is apparent when they are first turned "on", but their long-term properties such as how well they hold up over time (reliability, durability), how likely they are to fail and cause harm (safety, resilience), how easy they are to change if needed (flexibility, changeability, adaptability ...) and how well they work with others (interoperability). The following graphic shows the relationship of a set of 22 most common ilities to each other. The size of the nodes relates to the number of scientific papers written on each system property while the line weight indicates the strength of the diadic relationship. System properties in color indicate those that are of most interest to us. 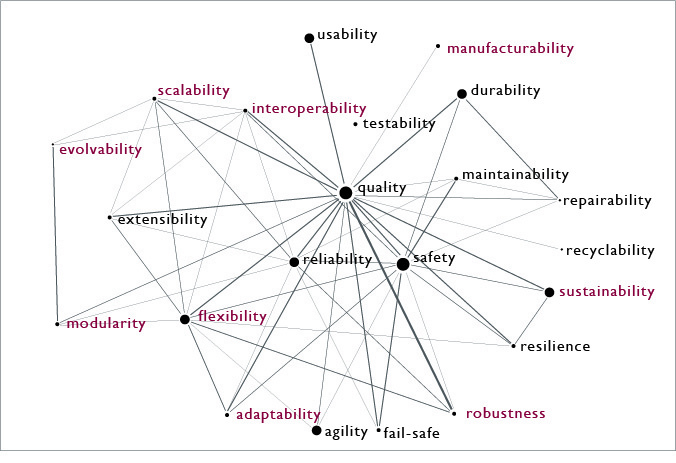 to read about this graphic: Book Chapter about the Ilities: Chapter 4 from "Engineering Systems: Meeting Human Needs in a Complex Technological World" by de Weck O., Roos D. and Magee C, MIT Press, January 2012 [PDF] - proof version. We are mainly concerned with how complex systems and products change over time and how they can be deliberately designed for change. Changeability is an umbrella term that captures the degree to which a system can undergo modifications in its configuration without incurring large increases in its complexity and cost. Flexible systems are those that exhibit a high degree of changeability. Systems that cannot be easily changed are often referred to as suffering from "lock-in". Lock-in is known as a phenomenon where better technologies or architectures are known to exist, but sub-optimal systems continue to be operated due to high switching costs. In order to avoid lock-in, systems can be designed with embedded flexibility to lower future switching costs and optimize performance and cost under uncertainty. We pinpoint where and how to embed flexibility during system design to promote better system evolution over time. One particular form of system evolution is the infusion of new technologies into existing products and systems. Reconfigurability is a specific kind of changeability where systems can change reversibly between a finite number of configurations with relative ease.